Prefer to listen? I've recorded this blog post for you to easily take it on the go! Did you know that 95 percent of diets fail people? People don't necessarily fail diets, they are simply not learning the tools they need to carry out healthy behaviors in the long-term. Common diet culture is straight up overwhelming. We have everything from ketogenic to intermittent fasting, Whole 30 to IIFYM, Gluten-free, fat-free, and so many in between. Guys, my head spins just thinking about it! It's easy to jump on board for a quick fix to lose some weight, but what happens next? While the initial results are usually there, most diets are not sustainable. They end up leading us down a road of restricting foods we love, binging on them later, and feeling guilty for it. This creates a whole cycle of highs, lows, and frustration. That’s no way to live… in my opinion. How do I know? I’ve been there. I’ve followed strict food plans, and while they always worked for a couple weeks, I would eventually cave and binge eat what I was craving. This led me to quit the diet and look for something new. I’m not here to bash on all of the diet plans in the world. I’m simply going to provide some facts on current diet trends, how they affect us, and what we can do to find a sustainable, and much easier solution for nutrition. Let me tell ya, you CAN eat all things you love and still be a healthy person. As humans, we naturally want to feel like we’re a part of something. That being said, our nutrition choices can often stem from what people around us are doing or trying. I’ve seen it numerous times. One person tries keto or intermittent fasting, and soon enough all of their friends are jumping on the train. We like to fit in. But guess what? Nutrition isn’t about fitting into a box or group. We all have a unique genetic makeup, with hormones, body systems, and cells that are unlike any other person. The food we eat directly affects these things. That’s why you’ll notice that some people can eat animal products, whereas for others it affects their digestive system. Or some people get an upset stomach from certain types of gluten products. If you’re an apparently healthy person (without high blood pressure, medical issues, or similar) you probably don’t need to be on a strict diet plan. If you do have certain needs, or are vegetarian/vegan by choice, disregard this because your food intake likely looks a bit different. Telling your body you can’t have a certain food group, like carbs or fat for example, is not only doing your body a disservice, but also your mind. If we simply allowed ourselves to be less rigid - eat the cake at a birthday party or go out for drinks with friends - we are not feeding that restriction. Put simply, by knowing that the option is there, we free ourselves from having to avoid it. 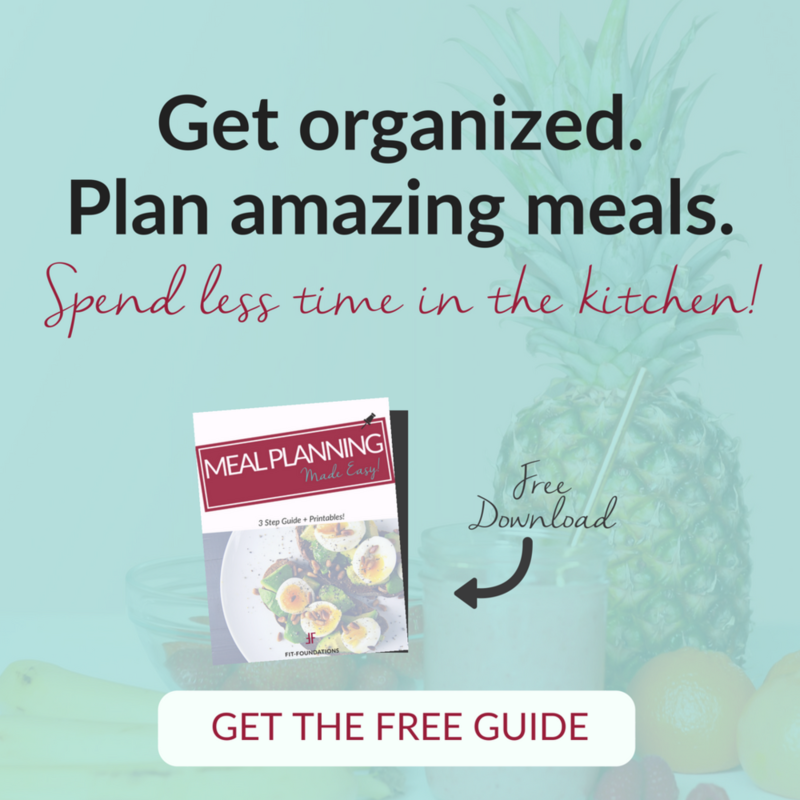 >>For free tools to help you on your fitness journey, check out my resources. Throw em’ all out the window. Really, you’ll feel better (my Type A, planning people out there are freakin’ out right now). There are no good foods or bad foods. Yes, some are better in terms of nutritional content than others but labeling foods means they aren't all equal. If we take on the perspective that all foods are equal, we feel less restricted and, therefore, less likely to binge eat something after holding out for a long time. Don’t worry. If it helps you (much like myself) you can put a couple FLEXIBLE guidelines in place for yourself. Unfortunately, I can’t tell you what that will look like for you. First determine how you want food to make you feel. That may sound like a weird question but, in all seriousness, do you want to feel energized? free? satisfied? After that, determine an acceptable daily calorie range using My Fitness Pal or this calorie calculator and track your calorie intake for a few days. The exercise is to gain awareness of where you’re at and where you need to be. Don’t get too strict on the counting. Eat by the 80/20 Rule - 80% wholesome and healthy, 20% treats and other things I love. And hey, sometimes this turns into a 70/30 or 60/40. Not every day will be perfect. Stop eating when I’m full - While I have no doubt I could take on my husband in an eating contest, I've learned that I just feel yucky when I'm stuffed. Learning to eat slow enough, so my brain and stomach can communicate, helps me stop eating at the right time. No food babies. Aim to have a source of carbs, protein, and fat in each meal - Eating balanced meals is so key to overall health, energy, and getting all of your important macro and micro-nutrients in. Fill your body with mostly wholesome ingredients - This goes back to the 80/20 rule. Try to cook most of your meals at home, cut out most of the processed junk, and shop on the perimeter of the grocery store. Eat the damn cake - Seriously. Love me some cupcakes, cake, cookie dough. Learning that I would not de-rail my whole life by treating myself every once in a while has been the most liberating of all. Aim to find a way of eating that serves your body, makes you feel good, and you could see yourself doing forever! If you're currently on a diet and it's healthy for you, keep on doing what works. Just be careful with restriction and the transition back into normal eating if it's much different. Moral of the story: Set a solid foundation in nutrition that allows you to get all your main nutrients, feel a sense of freedom, and not restrict your food intake.